This Cycling Tour of the Vale Europeu in Santa Catarina State takes you the dirt road way between various towns with residents of German and Italian ancestry in amongst the verdant hills and tumbling rivers of the state. Breaks and extensions can be made to visit waterfalls and peaks, with many natural and cultural highlights during your week of cycling. Our Adventure Tours of Brazil are all basic ideas that can be tailor-made to match your requirements. Any tour can include one or more destinations, and can be purely dedicated to hiking, although some mountains may include a little climbing that is still suitable for those without much experience. We can also arrange serious climbing trips. We can also mix them with other activities such as climbing, kayaking or tandem hang-gliding flights, some regular tourism, and some nightlife. We include all that you need during your trip, the accommodation with breakfast; all airport transfers and other road journeys; any activities and excursions with English-speaking guides and relevant entrance fees; plus some popular extras. For our Hiking Tours of Brazil, you only need to bring your favourite hiking boots and regular outdoor clothing and equipment. Any parts where a little climbing is necessary will include ropes, helmets and safety harnesses. All hikes and climbs are undertaken with an experienced, qualified local guide, with activity insurance included. All other equipment such as kayaks, mountain or road bikes, and of course your hang-gliding wings will be provided! We can arrange the trip in a number of different ways, however suits you, either self-guided (which is easy enough) or with one of our cycling guides; also with bikes and helmets included or bringing your own; and also for the comfortable amount of nights included here, or a little more pushed to cut out a day or two if a shorter trips is preferred. 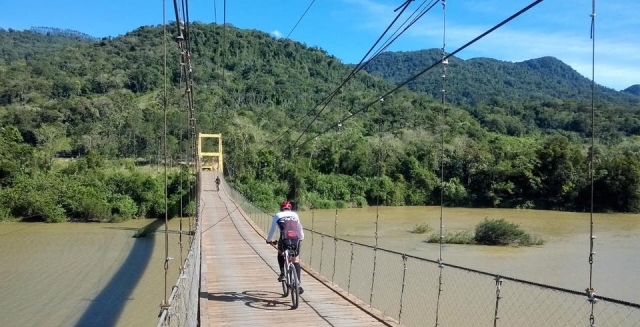 The Vale Europeu Cyclotourism Circuit is a great way around a wonderful part of the country, with scenery and activities to enjoy with Brazil Adventure Tours. Best Time to Visit: The heat of the summer months make December to February best avoided, although the circuit can be done at any time of year. Usually April to July give the best chance of good weather. 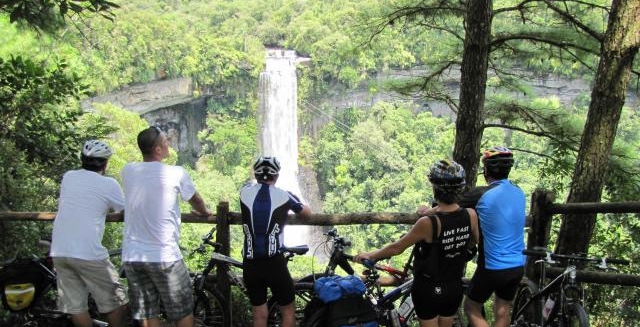 The Vale Europeu Cyclotourism Circuit begins in the Santa Catarina town of Timbo, close to the larger Blumenau. This region was settled principally by German and Italian immigrants in the 19th Century, and Blumenau now boasts that it has the second largest Oktoberfest in the world! The nearest airport is Navegantes on the coast, with around 90 minutes to drive up the Vale do Itajai-Açu to Timbo after arriving there. On arrival at your hotel, you can explore this quiet interior town, where the Rio Benedito meets the Rio dos Cedros, and bridges span the meeting point, including the photogenic footbridge. This will also be the starting point for your cycling tour of Santa Catarina. If you want us to include mountain bikes and helmets for the week, they will be waiting for you at the hotel. Your main luggage can also be left behind in the hotel store. The tour can be self-guided, or with a cycling guide, and possibly a support van too, recommended especially for larger groups and those without long distance cycling experience. The first day begins in a gentle way, with 25km of backroads as the wide valley opens out before you, and the hills of the next few days can be seen all around. At Ada, you climb east out of the valley for before dropping into neighbouring Pomerode, the most Germanic town in Brazil! 44km; 501m of climbing; 497m of descending. Heading east from Pomerode you turn south at the hills before a 300m climb takes you through them. Crossing the valley once more, you have a potential cut-off to the top of Morro Azul, a very steep climb to the paragliding peak, surrounded by blue hortensias, and with colourful green-headed tanagers and parakeets feeding in the trees. The circuit continues as you head south towards the Rio Itajai-Açu, crossing the main valley highway. Indaial is your stop for the night, although continuing to Ascurra is an easy way to save a day. 48km; 747m of climbing; 760m of descending for the circuit. Extra 14km; 571m of steep climbing and descending for Morro Azul. 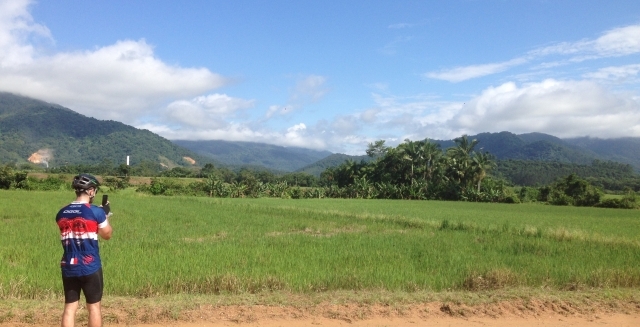 The easiest ride of the week is the road on the south bank of the Rio Itajai-Açu, heading up this beautiful, verdant valley. Old bridges and Lutheran churches make for nice photos along the way, and the largely flat ride can be extended with the pleasant continuation along the north bank to Apiuna, returning the same way. Accommodation is in Ascurra or Rodeio, with the latter having the San Michele vineyard to pass an hour in the afternoon. You shouldn't get too carried away though - not with the most difficult climb of the circuit to tackle in the morning! 27km; 306m of climbing; 271m of descending. Extra 25km; 125m of climbing and desceding for Apiuna. An early start in cool conditions is recommended for the big climb of some 700m over 8km, with a cut-off to the Cascata do Salto falls before. White angels lining the road and a large Christ the Redeemer are not hilly hallucinations, just the statues that gave rise to the Caminho dos Anjos name. A 2km zipline over the high meadows can give you a breezy break from the cycling before you descend through the timber forests. A cut-off to the Cachoeira do Zinco provides the chance to refresh before the final section up and over to Doutor Pedrinho. 45km; 1,100m of climbing; 600m of descending. Extra 15km; 513m of climbing and descending for Zinco. The high valley in which Doutor Pedrinho sits has two options for taking you up and over various valleys to Alto Cedros. The Veu da Noiva Falls is one of them, with a chance to dip in the cool waters after a 20min trail. Gruta Santo Antonio is the alternative, with a short trail dropping down to this large, shallow cave. Either option means a rolling day of shorter, punchy climbs and nice little descents through the high forests. Good cyclists can arrive at the Alto Cedros Dam in time for lunch, meaning that this day could also be combined with the following one to save a day for elsewhere. 31/34km; 1,100/1212m of climbing; 953/1,020m of descending. Another day of cycling up and down the high valleys takes you up to 933m above sea level on the open meadows. Again there are two possible trails leading each way around the dam on the Rio dos Cedros to meet up on the tops. A flat 1km extra takes you to Cachoeira Formosa, whose campsite has a bar as well as the waterfalls for cooling off. A beautiful descent takes you back down into the valley where you meet the scenic Rio Bonito Dam, and a short ride around the shores takes you to Palmeiras, where you stop for the night. 46/37km; 1,130/1,090m of climbing; 1,166/1,100m of descending, depending on which route you prefer. Day 8 : The Descent You Earned! Your week of cycling through Santa Catarina finishes with the kind of day that anybody who has ever ridden a mountain bike would enjoy! A gentle climb around the shores of the dam precedes a lovely shallow, winding forest descent. Then comes the breathtaking, brake-heating drop of over 300m in a winding 2km from the tops into the valley, skidding and sliding your way to the bridges at the bottom. A speedy riverside descent follows, before the final climb of the Vale Europeu Circuit, 300m up and over to Benedito Novo, because we wouldn't want the final day to be too easy! On arrival in Timbo, you can relax for the evening. 52km; 570m of climbing; 1,150m of descending. The Vale Europeu Cycling Circuit is set up for 7 days, although serious cyclists may prefer to shorten by a day or two. 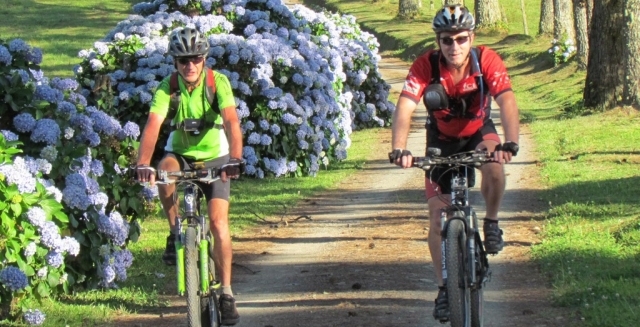 There are always plenty of trails to pedal in the area to make up for an early finish, with the Morro do Cachorro hang-gliding ramp and antennas being a 750m climb in 8km, and the rough dirt road through the middle of the Serra da Itajai National Park a tough 50km with 1,200m of climbing, with the possibility to hike to the top of Spitzkopf as well, the highest mountain in the park at 940m. You can combine this week of cycling with the Oktoberfest in Blumenau, some days at the beach in Florianopolis to finish, or any other of our destinations in Brazil.